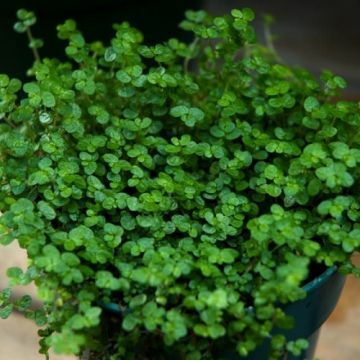 A Baby's Tears Plant is a delicate looking house plant that resembles a mat or carpet of tiny green leaves as it spreads over the sides of its pot. Baby’s Tears plants, which originally came from Corsica and Sardinia, have tiny round or bean- shaped leaves that grow on thin fragile stems. Baby's Tears houseplants can be used as table plants or as a small hanging plant. This very little plant requires a lot of attention. LIGHTING REQUIREMENTS: Baby’s Tears houseplants like bright indirect light but no direct sun. CARE INSTRUCTIONS WATER: Always keep the soil of a Baby Tear's Plant moist but never soggy. If the soil of a Baby's Tears House Plant stays too wet, the stems quickly rot. FERTILIZER: Feed every two weeks in the spring and summer when a Baby's Tears Plant is actively growing. Use a basic houseplant fertilizer at 1/2 the recommended strength when feeding a Baby Tear's Plant. TEMPERATURE: Normal household temperatures or even a little cooler are best for a Baby Tear's Houseplant. 60-75 degrees is an ideal temperature for a Baby's Tears Plant. 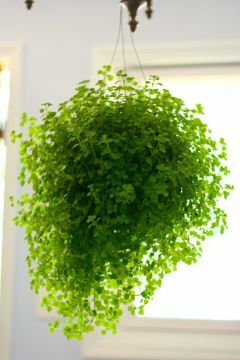 HUMIDITY: High humidity and good air circulation encourages a Baby's Tears Plant to grow well and not turn brown. FLOWERING: A Baby's Tears Plant gets tiny white star-shaped flowers in the late spring. The flowers on a Baby's Tears houseplant are fairly inconsequential. PESTS: Baby's Tears Plants are susceptible to whitefly, scale, and Aphids. You can read about these plant pests in the Glossary of the website. DISEASES: Root -rot due to over-watering is the main disease to that affects Baby's Tears Plants. 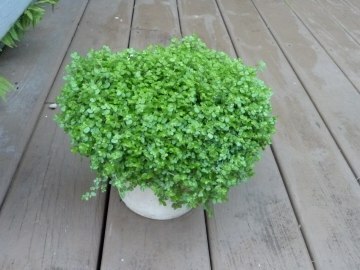 SOIL: Baby's Tears Plants require a well-aerated quick draining potting soil that contains a good amount of peat moss.